Relax at the racetrack in one of our 40 rustic 400 sq. 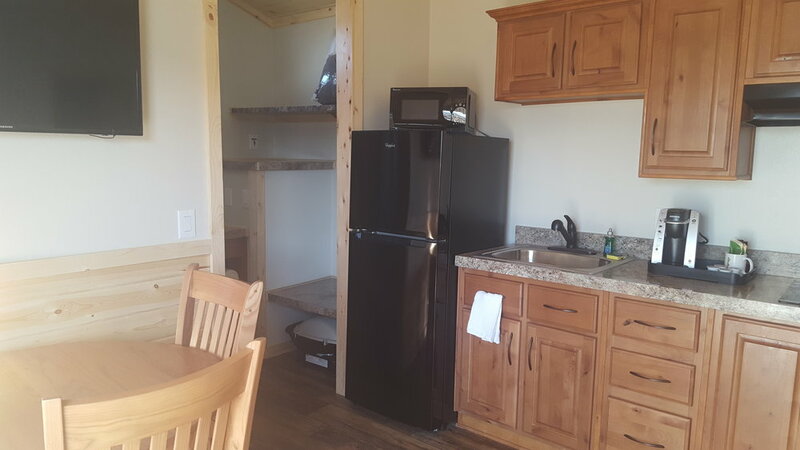 ft. 1 bedroom cabins featuring a comfortable queen size bed, sofa sleeper, flat screen TVs, dinette table, full size bathroom with shower, kitchenette with refrigerator/freezer, microwave, stove, all utensils, dishes, and cookware. Soak up the desert sun on the large patios, with picnic tables, and fire rings. Firewood is available for purchase, and portable BBQ's available for rent. Ample parking for cars and large RVs is available. The night before an event and the day of an event the front gate will be open for those who have cabin reservations to allow for easy 24 hour access. The internal guard gate that provides access to the paddock and the track is not left open after-hours. If you arrive after-hours and need assistance, please ring the doorbell at the gate and a CVR staff member will be there to assist you. A waiver must be signed and gate fees paid before proceeding through the second guard gate, you will receive a wristband to show you have been properly signed in. Wristbands MUST be worn at all times while on the property, including while on the track and must been left on for re-entry to the facility. Gate Fees = $10/person for a day pass (Ages 18+) $15/person for a weekend pass. VIP Members receive 15% OFF Cabin Bookings. Pets are an additional $25 per night. · Rate is for 2 guests, each additional guest is $15 per person. · Children 13 & under are Free with a paid Adult. All Reservations are made through our online reservation system on a first come first serve basis. For questions or problems regarding your reservation, please call (760) 668-6066. There is a $20 fee for reservations set up by phone or email. Housekeeping is scheduled for 9am ON the MORNING Your Day of CHECK OUT. PLEASE REMOVE ALL OF YOUR BELONGINGS PRIOR TO GOING TO THE TRACK FOR THE DAY. Lock Codes expires PROMPTLY at 9am. Pre-paid late check out fee is $25 until 11am, or $50 up until 2pm. After 2pm guest is subject to an additional night fee. If personal items remain in cabin after 9am without a pre-paid late check out, subject to availability. After 12pm guest is subject to additional night charge, subject to availability. • NO Tents, RV camping, or sleeping outside is allowed in the Ranch area. • The guest will be held responsible for any loss or damage to the property caused by themselves, their guests or any person for whom they are responsible, including anyone NOT named on the reservation. • Remember to lock your door by pressing LockState twice, CVR is not responsible for any lost or stolen items. • All visitors to CVR must obtain and wear wristbands at all times, sign in at guard gate. If your travel plans change and you must cancel your reservation, please email us at least 10 (ten) days prior to your arrival date to cancel your reservation. A full refund will be made. If you must cancel your reservation with less than 10 (ten) days notice, or check out early, you will be responsible for your entire reservation. Please note that the full amount is charged at the time of booking. 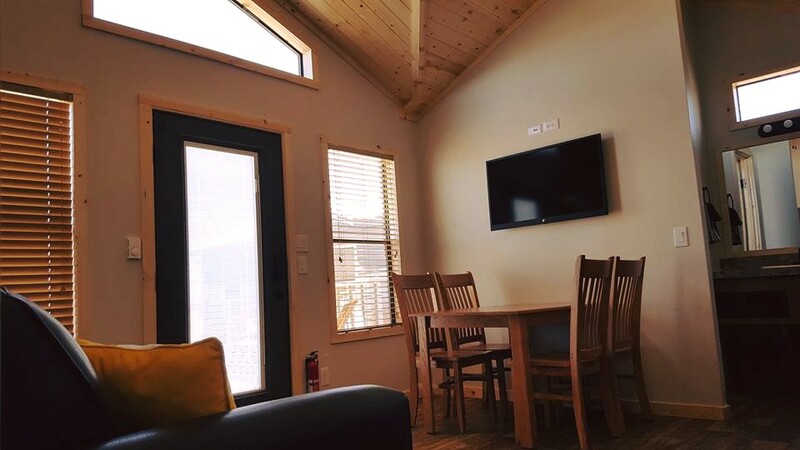 After checking out each cabin will be gone through and inspected with photos, the last reservation guest will be billed and charged for extra cleaning fees, any new damage or missing items. We have 5 Pet friendly units; Pets are an additional $25 per night. 20lbs. bags of ice are available for $7 ea. Firewood is available for $7 per bundle. Official CVR Blender Bottles $16 ea.